trash: Avoid or remove 1 tag. Forger is a bit of a black sheep in the console family. Being closest to Astrolabe, which combines Akamatsu Mem Chip and a NEH-type ability, Forger mashes together the effects of Access to Globalsec and Decoy into a cheap, low-influence investment. Because of its trashing ability, it's holds the unique position of being the only console that you would want to draw more than one copy of in an ideal situation. It's abilities are a strange combination though, so it worth your console slot? I see Forger as an either-or card for it's abilities, rather than a seamless combination of the two. Sure, it may occasionally help you avoid a crucial tag that you'd been paying off from traces thanks to it's link before, but the only self-tracing card as of Data and Destiny is Security Nexus, which is a bit of a catch 22, with them both being consoles (it's not impossible, but it's clunky, and would trash security nexus). From where it stands as a console, I can see it fitting into two deck types: decks that need 2 link for Underworld Contact and Cloud Breaker strategies, and tag-me decks. For its link, it's a natural fit for runners who already have one link to work with. It's tutor-able by means of Tyson Observatory, so it's even possible to include one copy in your deck, if you're going hardware-heavy and will be using the observatory anyway. As hardware instead of a resource, it also has the benefit of not being a trashing target in the instance that you do get tagged, and it immune to Foxfire, though it does become open to attack from Power Shutdown and hardware trashing cards. 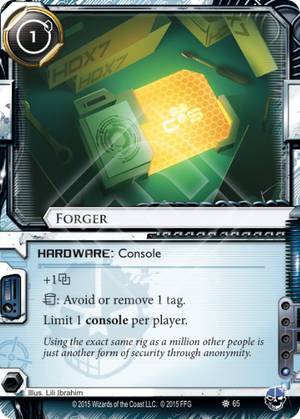 For decks that will need more than one link for their strategies, the previously mentioned Security Nexus and the as-of-yet released Reflection will probably be better choices in combination with cards more like Access to Globalsec, but Forger provides the cheapest credit and influence investment of the consoles by far. For decks that tag themselves, Forger helps with cards like Activist Support to pull off that hard-to-reach bad pub, avoid an unintentional tag from John Masanori, and it can work with Data Leak Reversal as an All-nighter or sorts to mill an extra card. Decoy can also obviously do all of this, but it's a question of if you want to use Hostage to grab multiple copies of decoy or Tyson Observatory if you want all of your Forgers. Ultimately, I don't think that Forger packs the punch that you'd expect from a console, but I do think it has some unique properties that make it worth considering. Self-trashing cards like DDoS and Clone Chip have make for some unique timing opportunities that can combine with other events or even on the corps turn, and being a piece of hardware gives it some variance from what similar cards might fear. Fast forward 2016, Post-MWL. Desperado now reduces your influence by one. Criminals tight on influence start looking at other consoles - Logos, Box-E, Forger, Doppelganger, Blackguard. Logos: Makes use of corp tempo and hand size+1. Box-E: MUs and hand size+2. Doppelganger: For decks that reward multiple runs. If your criminal deck benefits from all the Pros and is not hindered by the Cons, congratulations - you have found yourself a cheap utility console.